There was little point in having a new glass which could endure such a high loading if there did not exist a method of carrying suitably large currents into the lamp to develop this high loading. All previous lamps had relied on a liquid mercury electrode, but this was no longer possible since the increased pressure in MA lamps required them to operate at temperatures so high that any mercury would be completely vaporised. The only practical way to inject high currents into such a lamp is by means of a hot cathode, which emits copious quantities of electrons at its elevated operating temperature due to the principle of thermionic emission. Osram-GEC had been working on hot cathodes in an attempt to increase the power density of linear neon and fluorescent lamps, and the company was also well experienced in the use of similar electrodes at its Marconi-Osram Valve works, which shared the same premises as the lamp works in Hammersmith, London, for the manufacture of radio valves and other electronic tubes. There was no shortage of knowledge in this field and a new cathode was soon developed that met the particularly severe requirements of the mercury lamp. Had pure heated tungsten been used it would have run ridiculously hot and been evaporated and sputtered away rapidly, staining the arc tube black and absorbing much of the light the lamp generated. This is because tungsten has a high 'work function', in other words large amounts of energy are necessary to eject electrons from its surface, the energy being wasted as heat and without contributing to the light output of the lamp. This leads to a large voltage gradient immediately in front of the cathode which is emitting negatively charged electrons and receiving positively charged ions. The high electric field strength, called the cathode fall, accelerates these ions into the electrode at high velocity and because of their great mass they bombard it with significant force, physically destroying the electrode by sputtering it and further exacerbating the arc tube blackening problem mentioned above. Lamp life is dependent upon the rate at which the electrodes are gradually obliterated by this continual process. The electrode must therefore be designed in such a way that it can receive these ions while suffering the least possible damage. The way to accomplish this is to reduce the work function of the electrode so that it emits electrons freely, the volt drop ahead of it then being minimised, and the ions can be received with minimal impact. The principle is illustrated diagramatically in Figure 31. Other metals have lower work functions than tungsten, but are not so refractory and cannot endure the high temperatures present in the lamp without melting or physically evaporating, which leads to the same blackening problem. The electrode requirements were eventually met through a modification of the old Wehnelt cathode, developed in Germany in 1904. Wehnelt had identified that the thermionic emission from a heated wire is very considerably increased if it is coated with a layer of barium oxide. It now known that is due to the formation of a monolayer of barium metal over the surface of the wire, just one atom thick, these coatings having an extremely low work function value. In modern electrodes, barium oxide is often employed with the oxides of strontium and calcium, which have the effect of reducing the rate of evaporation of barium. Thorium oxide is often employed as well to further reduce the work function. An electron-emissive pellet of barium-calcium-strontium oxide was located at the heart of the electrode in the first Osira lamp, this imparting a very low work function to the electrode and enabling it to run at a relatively low temperature at which the effects of evaporation and sputtering are minimised. 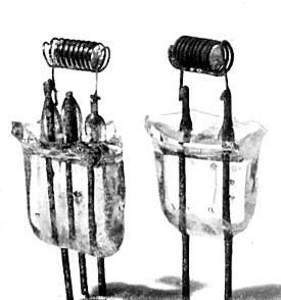 The pellet was located loosely inside a coil of tungsten wire and the electrode assemblies of this first lamp are pictured in Figure 32. Owing to the small diameter of the tungsten wire that was used the electrode still ran at a rather high temperature, and an improved design was soon introduced. Much heavier tungsten wire was used, and the pellet, protected inside this first coil, was then inserted into a second coil forming the main electrode. Heat was dissipated much better in this design, but still remaining just as effective as an electrode because of the existence of the monolayer over the coils. For convenience of manufacturing such electrodes, the electron-emissive pellet is never inserted in the form of the raw metal oxides. In the first Osira lamp the pellet was made from a mixture of barium-strontium-calcium silicates, and in nearly all lamps made thereafter the metal carbonates were employed instead. Before these compounds impart any benefit to the cathode they must first be converted to the oxide, and the monolayer of raw metal must be formed over the surface of the tungsten coil by a process known as electrode activation. The usual practice is to raise the electrodes to a very high temperature while the lamp is on the exhausting machine - either induced heating with a radio frequency oscillator or by passing a heavy electric current through the electrode if its shape permits this. Alternatively the electrodes may be activated by electron bombardment attained by striking a high current AC discharge in the arc tube, or by a combination of both methods. The high temperature treatment decomposes the metal carbonate or silicate to the oxide, the process being continued until all gases evolved during the process have been completely released and pumped away by a vacuum pump to which the arc tube is attached. At this high temperature in vacuum some reduction of the oxide then takes place leading to the formation of free barium metal which diffuses over the surface of the tungsten electrode thus forming the all-important monolayer for good electron emission. Thereafter the activated electrodes must not be allowed to come into contact with any air or oxygen since this would instantly destroy the monolayer and poison the electrodes, rendering them permanently useless. During normal lamp operation, evaporation of the monolayer is continuously occurring as is the diffusion of fresh metal out of the pellet held within the coils. The rates of each of these processes is depending on the operating temperature of the electrode and it is important that the electrode for each lamp be designed in such a way that its operating temperature will cause the rate of each process to balance perfectly. If the monolayer is evaporated too quickly, the electrode will become deactivated and it will lose its emission and the lamp will fail. If fresh material is diffused out of the pellet too rapidly then similarly it will be evaporated away as quickly as it is produced, leading to arc tube blackening and premature exhaustion of the pellet again with the consequence that the lamp will fail early. The most scientific work in this field was conducted under Dr. J.N. Aldington of Siemens Electric Lamps & Supplies in Preston, UK (no connection with Siemens of Germany). His research laboratories methodically tested literally hundreds of different electrode arrangements and lamp chemistries to obtain longer, more efficient lamp lives. The extent of the work carried out by Siemens is easy to recognise simply by virtue of the fact that today it is unusual to come across any two Siemens MA lamps of the same construction, practically all have different electrodes, starting aids or methods of assembly. In particular, many hollow cathode designs were investigated as well as different electron-emissive materials, all with the aim of lowering the lamp striking voltage, reducing the rate of arc tube blackening, and increasing electrode life. One other electrode worthy of mention is the type employed by BTH, in which thorium oxide was also incorporated into the emissive pellet. This, being a mildly radioactive substance, helps to cause ionisation in the discharge tube and lowers the striking voltage that is required.